The word “Maelstrom” should make your ears perk up. Err, you know what I mean. Like, when you hear it, it should make your ears perk up. If you’re just reading it in the article, you’re just reading it. Maybe you hear, like, your own voice in your head so technically you’re hearing it, but you’re not, like, “hearing” hearing it so your ears won’t perk up. Let me start over. The word “Maelstrom” should make you take notice. 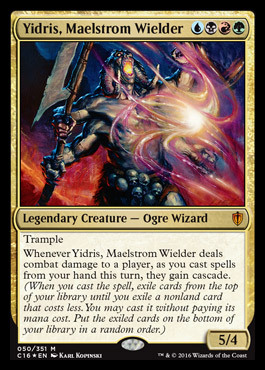 “Maesltrom” is a word they put on magic cards to let you know they are going to be worth money. Cascading is a form of cheating in Magic that is somehow legal. When you cascade, you get hecka card advantage and it’s also random so it’s fun, more fun than just tutoring for something. 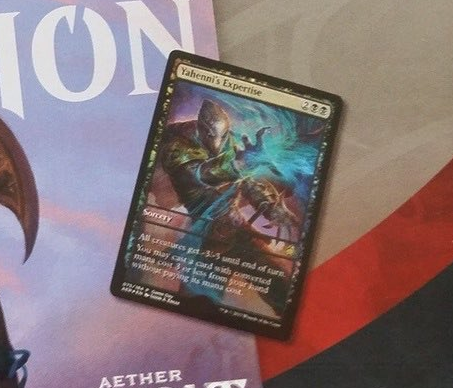 Maelstrom Wanderer is a popular commander so it stands to reason that another cascade commander will also be popular. Did I mention this one lets us play black spells? Because this one totally lets us play black spells. Behold. This guy does it all, I mean, mostly. You still have to make contact with him, so cards that enable that are worth a look as well as spells that have a higher printed CMC than you end up paying. If you can cast an expensive spell you can both dome them with Vial Smasher and also cascade into good stuff. 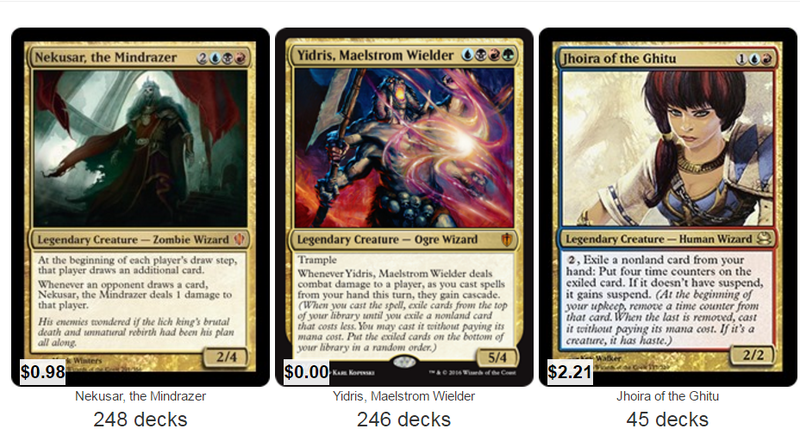 Yidris has been the number 3 most popular commander searched for on EDHREC every day for the last month and Vial Smasher is not far behind. With a new focus on spells that enable these two strategies, we could see some movement on a few key cards. I have some ideas. This card is underrated and I feel like I bear some responsibility for that because I slept on this in my set review. I feel like I filed this under “I like this card OK but I don’t like it financially” which may have been because it was $2 or $3 pre-sale (I don’t remember) but I’m warming to this. If you think about it, you’re most likely playing in a pod with 4 players which means 3 opponents which means a 3 mana reduction. You look at EDHREC and notice that like 3,500 people are jamming Go for the Throat in their decks. With Curtain’s Call, you’re paying Dark Banishing mana and getting a double Go For the Throat with no color or type restrictions. Not only that, but you’re paying Dark Banishing mana for a spell that’s going to dome them for 6 with Vial Smasher and cascade into any CMC 5 or less spell when you cast this after hitting them with Yidris. All of the undaunted stuff is good in this deck (ish) but this is by far the best and I feel like it’s not relegated to decks where you’re trying to cast high CMC spells. Granted, there is inherent weakness with this spell given you need two legal targets to cast it, but this isn’t Hex in Limited we’re talking about. We’re not trying to cast Decimate. We’re looking for two legal targets in a game with multiple opponents – it’s hardly a drawback. Speaking of Hex and Decimate, both of those spells are better in EDH and scale well into larger playgroups. This is the same and I feel like this is too cheap at $0.50. I doubt undaunted stuff gets reprinted soon and I feel like any black deck can jam this if it wants to. If you’re playing with 5 people this is like 5 times better than Go For the Throat. At its current price, I feel like the risk is pretty low, the upside is pretty high and people are going to start noticing this card. I feel very strongly about this. There is a lot of supply to soak up, but we’re up to the challenge. A lot of the copies that get opened will end up in the deck that gets built as a result. This card is good enough to be banned in Modern and Legacy. A card good enough to be banned in both of those formats is worth looking at, don’t you think? We’re about to see one of two scenarios pan out – either being banned in Modern and Legacy is too strong and EDH won’t be able to muster enough demand to soak up all of these copies and the card will go nowhere or the fact that it’s banned in Modern and Legacy means the card is stupid powerful and EDH will make a stupid powerful card end up worth money. Treasure Cruise was reprinted in the Yidris deck which was a great opportunity to reprint Dig that they missed (or just didn’t decide to take). When else can they reprint Dig? It’s not going in Eternal or Modern Masters, not in Standard. It basically has to go in Commander 2017 to hurt the price. Commander 2018 will bring it back down, but by then it will have gone up if it was going to. I think this is as cheap as it will ever get, it’s bannably good, it’s stupid in Yidris, it’s tough to reprint and I don’t feel like I need a fifth thing. 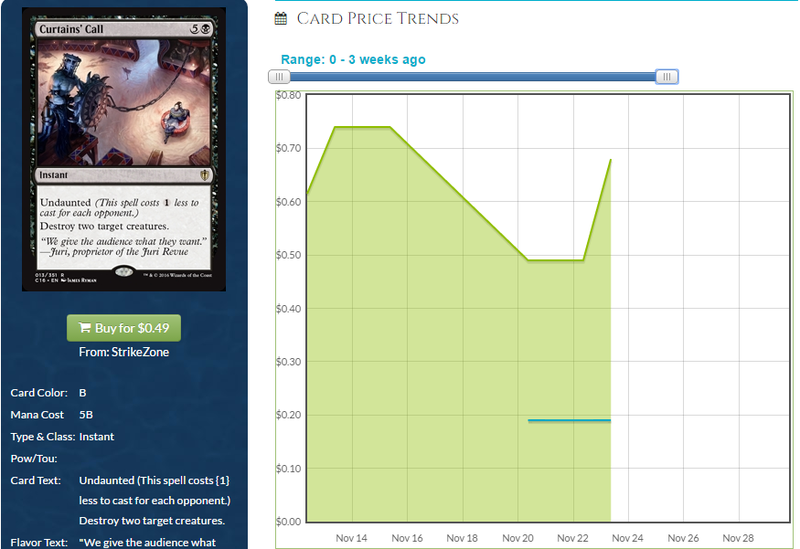 This card seems like a pretty good target and I will be a little surprised if this isn’t $2 or $3 in a year or two. There are a lot of copies to soak up, but the card is powerful. This is the best red wrath ever printed. We have seen this card basically shrug off one reprint already. Do I expect it to shrug this one off? Not exactly, and therein lies opportunity. 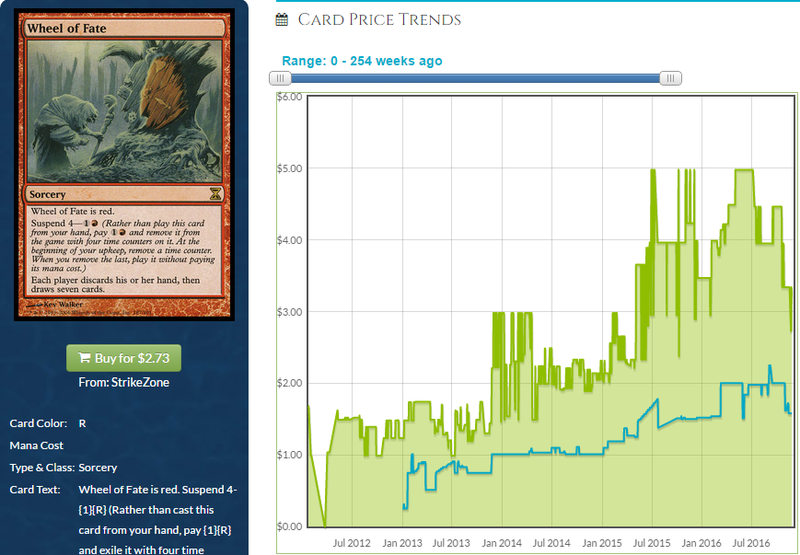 I think this printing in Commander 2016 will make it pretty cheap and cheap means there is a chance to scoop these. You know how I love those backward-J-shaped graphs because they’re an indication that we’re at the part of a U-shaped graph where we can still make some money. Blasphemous Act is unlikely to be reprinted in Commander 2017 because they seem to be skipping years which means you can get these for bulk and wait two years to see if this gets up to $3 again. You can make money on this card, so make money on this card. 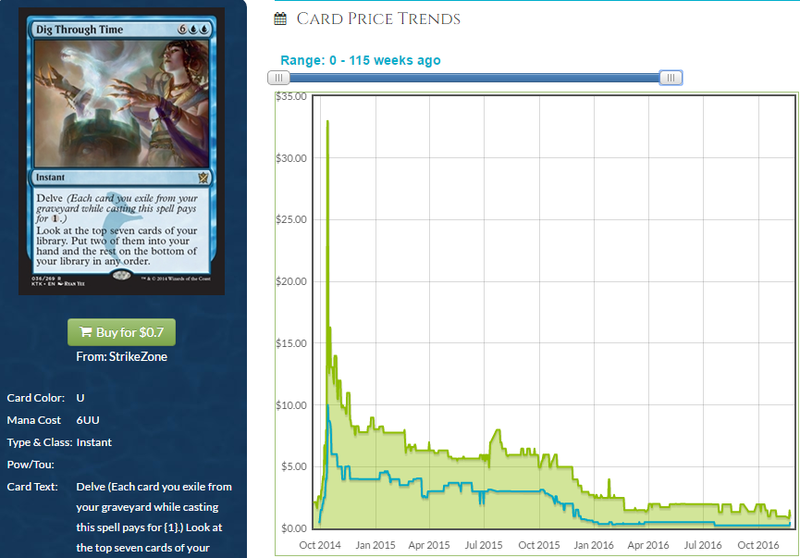 That’s all I want to talk about in terms of cards that are expensive and get cast for less expensive because there is another trend I am noticing in Yidris decks. That’s that people are tending to play wheel effects in Yidris. A lot. Nekusar is using a lot of these wheels and since Nekusar isn’t going anywhere, we’re going to see more competition for these cards, even from people who already have copies of them that they’re using. When Leovold was printed, we saw an increase in Teferi’s Puzzle Box and Anvil of Bogardan because those can go in Leovold decks. Red wheels, however, cannot and this gives us a chance to grab red wheels before they go up. Will they? You tell me. This graph is for Wheel of Fate. There is quite a drop-off to the next-most used but you will notice that Yidris uses it as much as Nekusar, maybe more as time goes on. The demand for this card just doubled. Its price might not double, but its demand doubled and that’s pretty significant. Is there money to be made on Wheel of Fate? Dunno, let’s look. 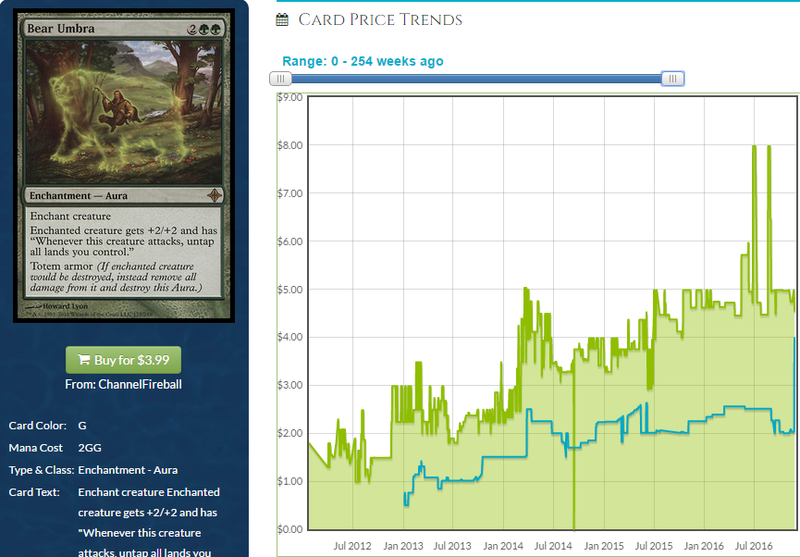 It would appear Nekusar demand has made it creep up. Now we’re looking at a potential second spike happening, which is even more promising. I think there is money to be made here, and out of all of the wheels, this is the one I’m most enthusiastic about. It’s really tough to reprint suspend cards often and this just had its demand double with more sure to come later. We have seen what could happen based on other wheel effects that Leovold spiked. Speaking of which, I imagine Puzzle Box isn’t done going up. You’re late to the party but sometimes even people who show up late can grab the last few cold beers at the bottom of the cooler if they’re willing to get their sleeves a little wet. Finally, there’s one more thing that makes me want Wheel of Fate right now. 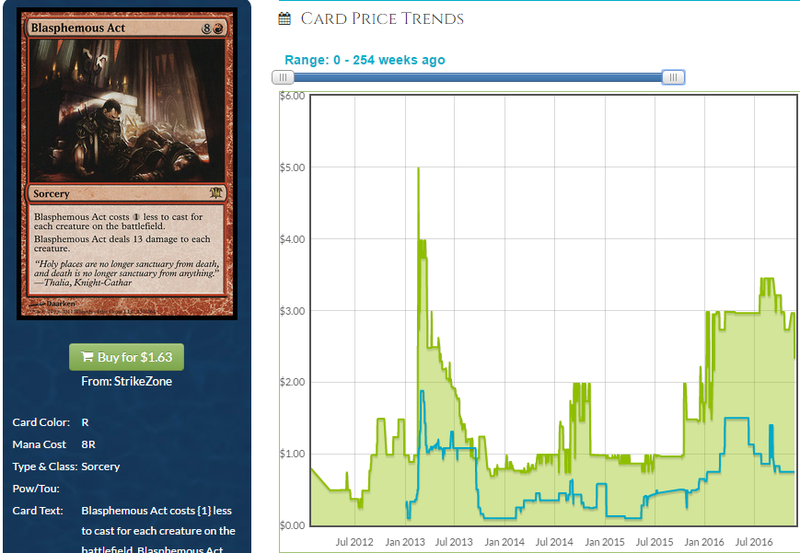 If this is a cycle, casting Suspend cards for free off of decent spells is a game-changer. I think you buy all of the suspend stuff. The rest of the wheels don’t seem as juicy because they either got reprinted or are too expensive. Puzzle Box may be worth a look, though. Leovold hype is still powering it, but it’s not good in the Yidris deck. Finally, we want to be hitting them. There isn’t a ton of money to be made on Whispersilk Cloak unless you’re picking it out of bulk, so let’s look at cards that let you get through again if you did once. Second spike HYPE. 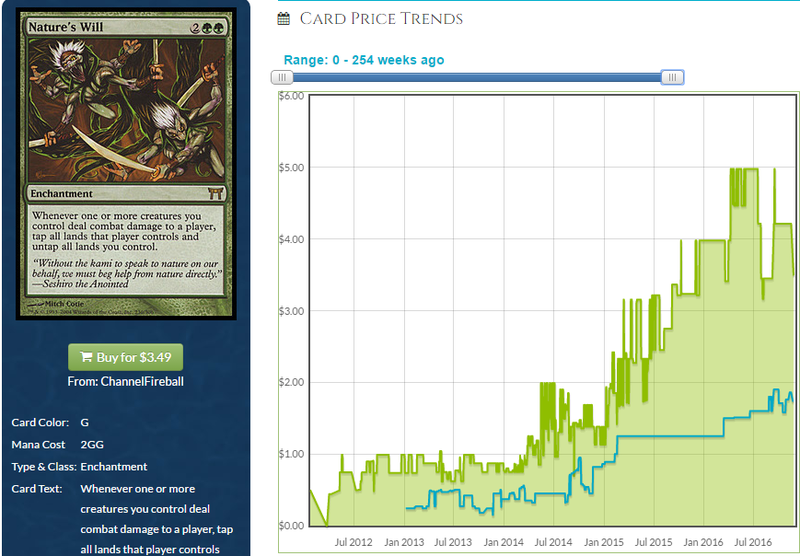 Nekusar made this and other Relentless Assault effects go up and this is on its way back down. We’ve seen where one card making it spike and bringing all of the loose copies out of the woodwork made it go, Yidris is sure to at least hit the benchmark set by Nekusar and very likely exceed it. This is silly with Yidris, so, you know, play it in that deck. And buy it. A lot of copies are concentrated in the hands of dealers which means buying will signal the market and the cheap copies in binders and boxes that filled in the bottom of the price pyramid last time around are exhausted. Expect this to go up. I feel like I talk about this every 6 months and whenever I do, it’s more expensive than it was the last time I talked about it. This card is on the uptick, anyway, they missed a chance to reprint it in the Kaseto/Ezuri deck and it pairs very nicely with hitting them in the face with your commander. Saskia could honestly use this, also. This card seems solid and it was growing already. I like this a lot and you should pick it up. I would be remiss if I mentioned this without also mentioning my favorite aura. Bear Umbra is nuts. It’s an infinite combo with Hellkite Charger and that has been a staple of durdly EDH decks for years. This is Nature’s Will but only for your lands and you have to attack them with a specific creature. The upside is that you’re only really relying on hitting them with your commander anyway, and this also keeps him alive. This is going to go up until they reprint it. Luckily this isn’t in Planechase or Archenemy already so we’re not getting more copies of it dumped on us with some Anthology reprinting – this is in ROE and that’s it. ROE boxes are expensive and not getting popped so the umbras we got is the umbras we got. 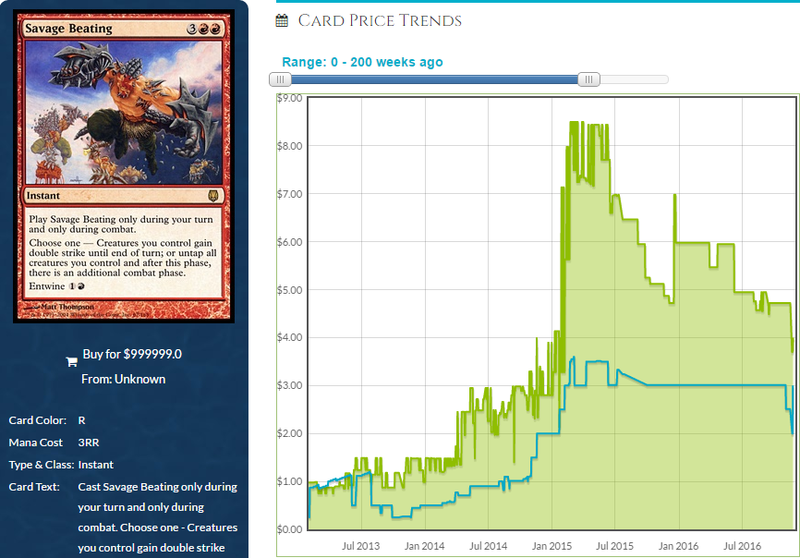 I like this long-term and Yidris being popular certainly won’t hurt this price. I feel pretty good about most of these. I am interested in particular to see what happens with Curtain’s Call because I like that card and think it can go up and also Dig Through Time because that case can help us evaluate cards like it in the future. No matter what happens, wheels and Relentless Assault effects have some upside. Look into that stuff to see if there is anything I didn’t like the margins on if you’re feeling ballsy. Don’t forget to bookmark EDHREC – it’s the best resource for this sort of stuff and just glancing at the page for a commander is enough to give you a sense of what to pick up. That’s all for me this week – join me next week where we’re sure to have more accidental Aether Revolt spoilers and updated EDHREC metrics for other popular commanders. Ciao, nerds! Wheel of Fate just got reprinted. You don’t have to hit anyone with Bear Umbra to untap all your lands. Wasn’t the reprint just commander? Foils are still gold then, no? These are some great picks! I’ve been bullish on Bear Umbra, Nature’s Will and Wheel of Fate for awhile. Have a nice little bundle of fools that I plan to keep tucked away for years.